The Indian vector control programme similar to other programmes in the world is still reliant on chemical insecticides. Anopheles culicifacies is the major vector out of six primary malaria vectors in India and alone contributes about ⅔ malaria cases annually; and per se its control is actually control of malaria in India. For effective management of vectors, current information on their susceptibility status to different insecticides is essential. In this review, an attempt was made to compile and present the available data on the susceptibility status of different malaria vector species in India from the last 2.5 decades. Literature search was conducted by different means mainly web and library search; susceptibility data was collated from 62 sources for the nine malaria vector species from 145 districts in 21 states and two union territories between 1991 and 2016. 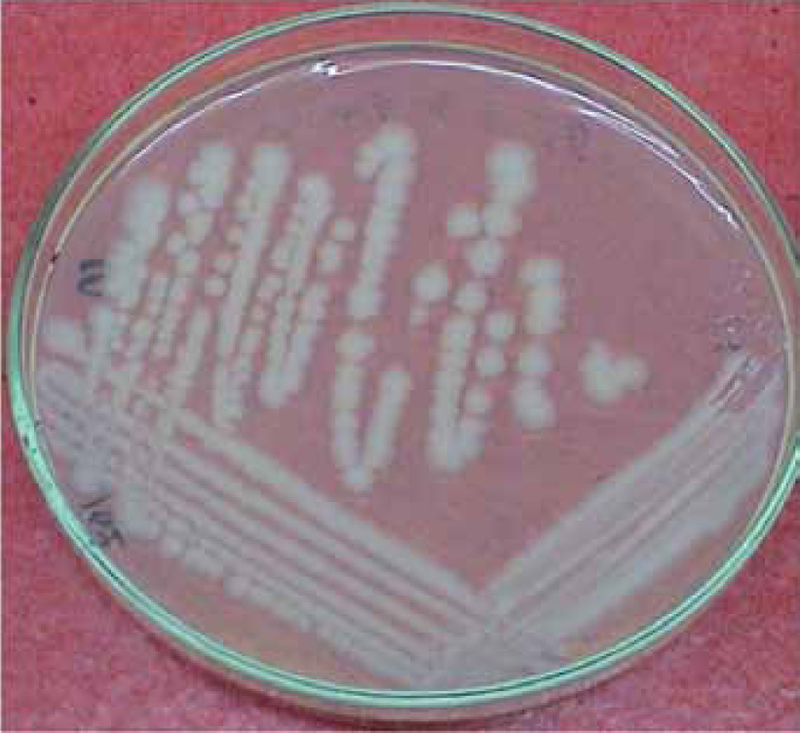 Interpretation of the susceptibility/resistance status was made on basis of the recent WHO criteria. Comprehensive analysis of the data indicated that An. culicifacies, a major vector species was resistant to at least one insecticide in 70% (101/145) of the districts. It was reported mostly resistant to DDT and malathion whereas, its resistant status against deltamethrin varied across the districts. The major threat for the malaria control programmes is multiple-insecticide-resistance in An. culicifacies which needs immediate attention for resistance management in order to sustain the gains achieved so far, as the programmes have targeted malaria elimination by 2030. Background & objectives: Malaria is a life-threatening disease caused by Plasmodium parasites. The life-cycle of Plasmodium species involves several stages both in mosquito and the vertebrate host. In the erythrocytic stage, Plasmodium resides inside the red blood cells (RBCs), where it meets most of its nutritional requirement by degrading host’s haemoglobin. L-arginine is required for growth and division of cells. The present study was aimed to demonstrate the effect of supplementation of different concentrations of L-arginine and L-citrulline on the growth of parasite, and effect of the culture supernatant on the host’s peripheral blood mononuclear cells (PBMCs). 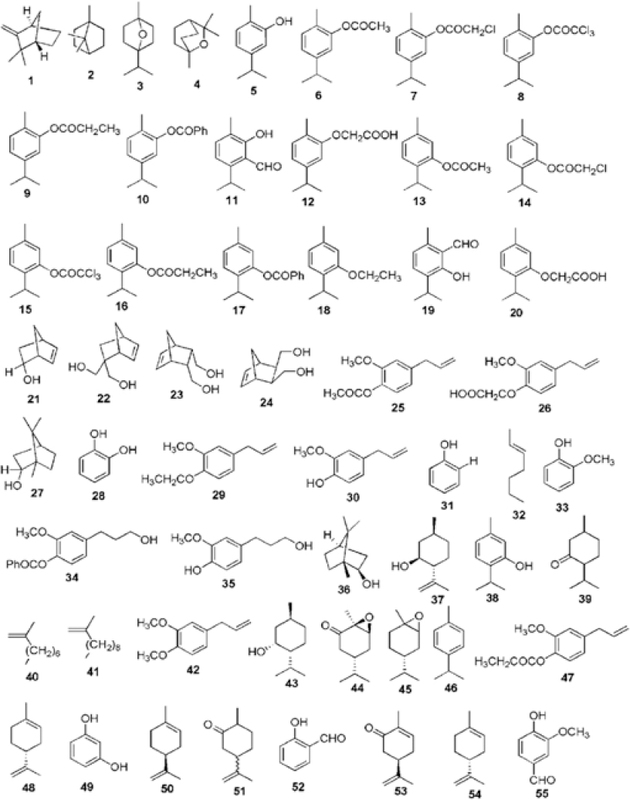 Methods: To examine the effect of supplementation of L-arginine and L-citrulline, Plasmodium falciparum (3D7 strain) was cultured in RPMI 1640, L-arginine deficient RPMI 1640, and in different concentrations of L-arginine, and L-citrulline supplemented in arginine deficient RPMI 1640 medium. To have a holistic view of in vivo cell activation, the PBMCs isolated from healthy human host were cultured in the supernatant collected from P. falciparum culture. Results: Growth of the parasite was greatly enhanced in L-arginine supplemented media and was found to be concentration dependent. However, parasite growth was compromised in L-citrulline supplemented and L-arginine deficient media. The supernatant collected from L-arginine supplemented parasite media (sArg) showed increased FOXP3 and interleukin-10 (IL-10) expression as compared to the supernatant collected from L-citrulline supplemented parasite media (sCit). Interpretation & conclusion: The in vitro culture results showed, decreased parasite growth, and decreased expression of programmed cell death-1 (PD-1) (a coinhibitory molecule) and IL-10 in the L-citrulline supplemented media as compared to L-arginine supplemented media. Hence, it was concluded that L-citrulline supplementation would be a better alternative than L-arginine to inhibit the parasite growth. Background & objectives: Lassa fever has been endemic in Nigeria since 1969. The rodent Mastomys natalensis has been widely claimed to be the reservoir host of the Lassa virus. This study was designed to investigate the distribution of species of rodents in three states (Edo, Delta and Bayelsa) of Nigeria and to determine the prevalence of Lassa virus amongst trapped rodents in the selected states. Methods: Rodents were trapped during November 2015 to October 2016 from the three states in South-South region of Nigeria. Total RNA was extracted from the blood collected from the trapped rodents. Reverse transcription polymerase chain reaction (RT-PCR) was used to confirm the presence of Lassa virus in the rodents. Results: The results revealed that six species of rodents were predominantly present in these geographical locations. Mus musculus (39.4%) had the highest prevalence, closely followed by Rattus rattus (36.1%), R. fuscipus (20.3%), M. natalensis (2%), Myosoricinae soricidae (1.2%) and R. norvegicus (1%). The overall positivity (carrier rate) of Lassa virus was 1.6% amongst the 1500 rodents caught in the three states. In Edo and Delta States, the RT-PCR results showed presence of Lassa virus in R rattus, M. musculus and M. natalensis. On the other hand, only M. natalensis was detected with the virus, amongst the species of rodents caught in Bayelsa State. M. natalensis recorded the highest Lassa virus among rodents trapped in Edo (87%), Delta (50%) and Bayelsa (11%) States respectively. Interpretation & conclusion: The rather low Lassa virus positive among rodents in Bayelsa State of Nigeria may explain the absence of reports of outbreak of Lassa fever over the past 48 yr in the state. The results also confirmed that apart from Mastomys natalensis, other rodents such as Rattus rattus and Mus musculus may also serve as reservoirs for Lassa virus. From the findings of this cross-sectional study, it was concluded that a more comprehensive study on rodents as reservoir host, need to be undertaken across the entire states of Nigeria, for better understanding of the epidemiology and endemicity of Lassa fever. Background & objectives: Anopheles stephensi is one of the most important urban malaria vectors in India and contribute about 12% of total malaria cases. An. stephensi has three ecological variants; type, intermediate and mysorensis that can be differentiated on the basis of differences in number of ridges on egg float and on the basis of spiracular indices. Because of its anthropophilic nature the ‘type’ form is an efficient malaria vector. In the present study, the egg surface morphometry and morphology of An. stephensi’type’ form was studied and detail distinguishing characters were recorded for its correct identification. Methods: Eggs of An. stephensi ‘type’ form were studied by scanning electron microscopy (SEM) after sputter-coating with gold. 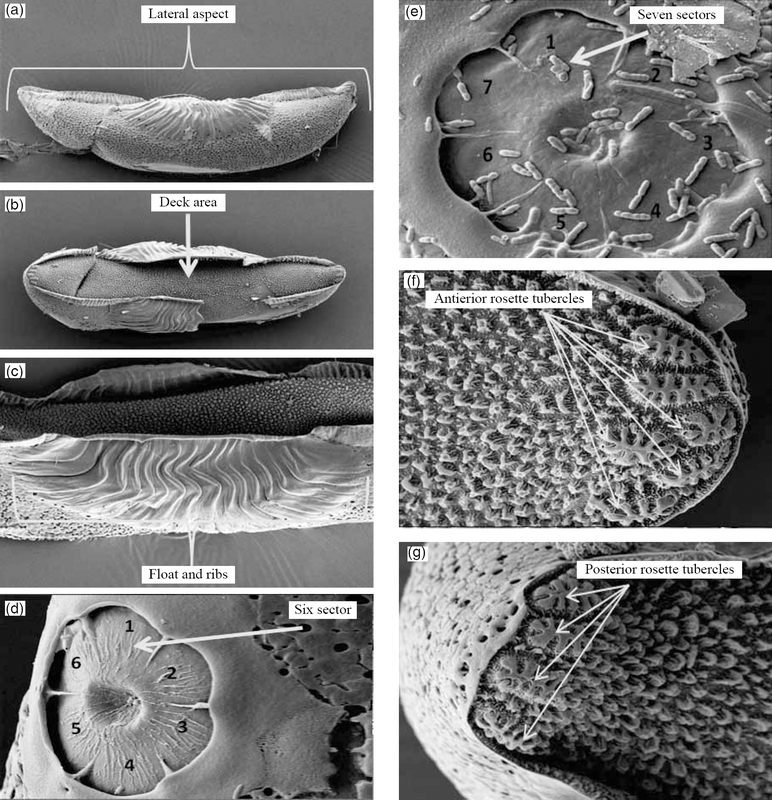 In total 23 egg characters were analysed morphologically and morphometrically, which included egg attributes, deck attributes, ventral tubercles, micropyle and float attributes. Results: The dorsal surface of the egg of ‘type’ form was curved while the ventral surface was concave and both anterior and posterior ends were blunt. The average length and width of egg was 473.94 ± 11.18 and 154.69 ± 2.66 μm respectively. The number of float ribs observed was 20.33 ± 0.33. The maximum length of float was found to be 246.57 ± 15.27 μm, whereas maximum width was 87.16 ± 3.83 μm. Interpretation & conclusion: The present study has generated some important data which is specific to An. stephensi ‘type’ form and provided significant morphological and morphometric standards for its correct identification. This information could be useful in differentiation of An. stephensi ‘type’ form from other ecological forms of the same species as well as other species of Anopheles. Background & objectives: Coxiella burnetii (C. burnetii) bacterium, the causative agent of Q fever has regained importance due to the increasing cases of infections and outbreaks. A cross-sectional descriptive study was conducted to investigate the seroprevalence of C. burnetii in human populations of Erzincan province located in the eastern Turkey, identify the risk factors, and to explore the relationship between geographical features. Methods: A total of 368 people residing in the rural (306) and urban (62) areas of the province were included in the study. Serum samples were analyzed for the presence of C. burnetii phase II IgG antibody using ELISA (Virion/ Serion, Wurzburg, Germany). Spatial analyses were performed to evaluate correlations between seroprevalence and geographical features. Results: The overall seroprevalence of C. burnetii was found to be 8.7% (32/368). In rural residents it was 8.5% (26/306), while in urban population it was 9.7% (6/62). Cattle breeding and contact with animal afterbirth waste were found to be major risk factors, and were significantly correlated with seropositive cases (p<0.05). The seropositive cases were only observed in the areas between 1067 and 1923 masl. Of the total seropositive cases, 65.6% were within 1000 m and 87.5% within 4000 m of rivers and their main tributaries. Around 59.4% cases were observed in areas with a slope of 0 to 5°. Interpretation & conclusion: The results of the study showed that C. burnetii seroprevalence was higher than expected, and significantly differs according to geographical features of a region. Significant risk factors include raising cattle and exposure to infected animals or their birth products/secretions. It is also more frequent in areas with higher number of rivers and streams, higher altitude and lower slope. Background & objectives: Aedes aegypti is an important vector for transmission of dengue, yellow fever, chikungunya, arthritis, and Zika fever. According to the World Health Organization, it is estimated that Ae. aegypti causes 50 million infections and 25,000 deaths per year. Use of larvicidal agents is one of the recommendations of health organizations to control mosquito populations and limit their distribution. The aim of present study was to deduce a mathematical model to predict the larvicidal action of chemical compounds, based on their structure. 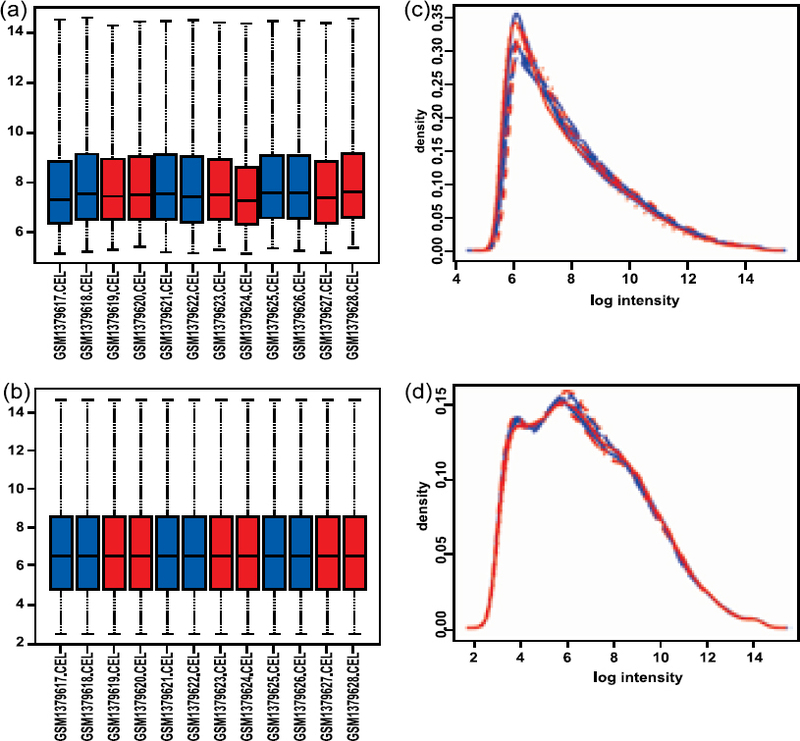 Methods: A series of different compounds with experimental evidence of larvicidal activity were selected to develop a predictive model, using multiple linear regression and a genetic algorithm for the selection of variables, implemented in the QSARINS software. The model was assessed and validated using the OECDs principles. Results: The best model showed good value for the determination coefficient (R2 = 0.752), and others parameters were appropriate for fitting (s = 0.278 and RMSEtr= 0.261). The validation results confirmed that the model has good robustness (Q2LOO = 0.682) and stability (R2-Q2LOO = 0.070) with low correlation between the descriptors (KXX = 0.241), an excellent predictive power (R2ext = 0.834) and was product of a non-random correlation (R2Y-scra = 0.100). Interpretation & conclusion: The present model shows better parameters than the models reported earlier in the literature, using the same dataset, indicating that the proposed computational tools are more efficient in identifying novel larvicidal compounds against Ae. aegypti. Background & objectives: Dengue is highly prevalent in tropical and subtropical regions. The prevalence of dengue is influenced by number of factors, i.e. host, vector, virus and environmental conditions including urbanization and population density. 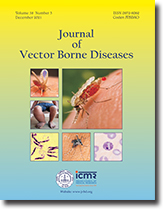 A cross sectional study was undertaken to determine the seroprevalence of dengue in two selected villages that differed in the level of their urbanization and population density. Methods: Two villages with demographically well-defined populations close to Pune, a metropolitan city of western India, were selected for the study. Age stratified serosurvey was carried out during February to May 2011 in the two villages—a rural village A, located 6 km from the national highway with a population density of 159/km2; and an urbanized village B, located along the highway with a population density of 779/km2. Assuming a low seropositivity of 10%, 702 serum samples were collected from village A. Sample size for village B was calculated on the basis of seropositivity obtained in village A, and 153 samples were collected. Serum samples were tested for the presence of dengue virus (DENV)-specific IgG. Simple proportional analyses were used to calculate and compare the seroprevalence. Results: Of the 702 samples collected from village A, 42.8% were found positive for anti-DENV IgG. A significantly higher seropositivity for DENV (58.8%) was found in village B. In village A, there was an age dependent increase in seroprevalence; whereas, in village B, there was a steep increase from 17% positivity in 0–10 yr age group to 72% in the 11–20 yr age group. 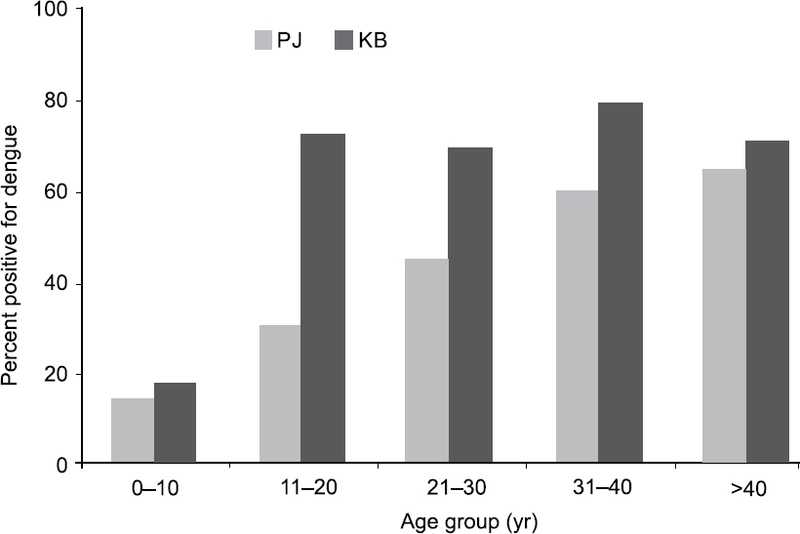 The seroprevalence was almost similar in the older age groups. Interpretation & conclusion: The observations suggested that prevalence of dengue is probably associated with urbanization and host population density. Areas that are in the process of urbanization needs to be monitored for prevalence of dengue and its vector, and appropriate vector control measures may be implemented. Background & objectives: Malaria is considered as the most important parasitic disease of humans, causing serious illness that can be fatal, if not diagnosed and treated immediately. It is a multisystem disorder affecting nearly every system of the body. The aim of the present study was to evaluate the involvement of cardiovascular system in severe malaria using non-invasive methods. Methods: This prospective study was conducted on patients of severe malaria who were admitted between June and November 2015 in the Department of Medicine, Rajendra Institute of Medical Sciences and Hospital, Ranchi, Jharkhand, India. 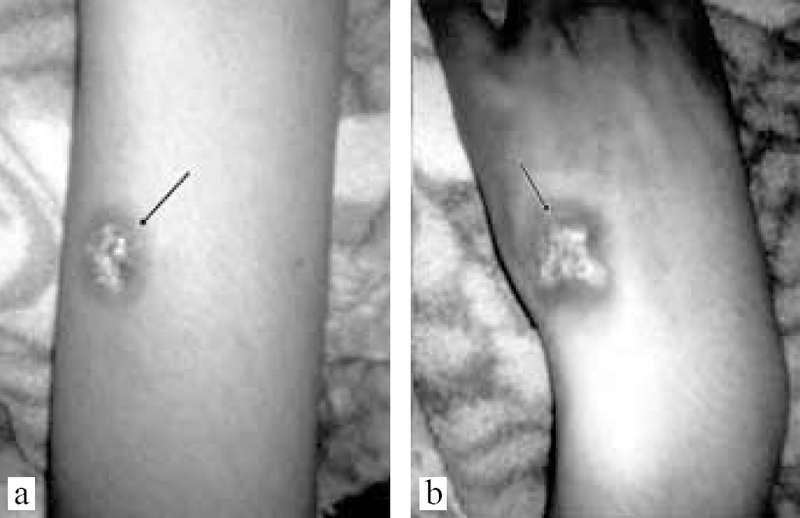 A total of 27 cases (18 males and 9 females; age ranging between 15 and 70 yr) of severe malaria (P. falciparum 24; P. vivax 1; mixed 2) were diagnosed by microscopic examination of peripheral blood smear and bivalent rapid diagnostic test (RDT) kit. The assessment of cardiovascular system was done by clinical examination, chest X-ray, ECG and transthoracic echocardiography. Results: In all, 7 (26%) patients were found to be suffering from circulatory failure, out of which one was P. vivax case and rest were cases of P. falciparum infection with high parasite density. One patient died due to cardiovascular collapse. ECG revealed sinus bradycardia [Heart rate (HR): 40–60] in 7% of the cases, extreme tachycardia (HR: 120–150) in 3.7% of cases and premature arterial ectopic with tachycardia in 3.7% of patients (p <0.05). The echocardiography findings were global hypokinesia with decreased left ventricular ejection fraction (<55%) in 11.1%, grade 1 left ventricular diastolic dysfunction in 3.7%, mild tricuspid regurgitation (TR) with mild pulmonary artery hypertension (PAH) in 3.7% and mild pericardial effusion in 3.7% of the cases. 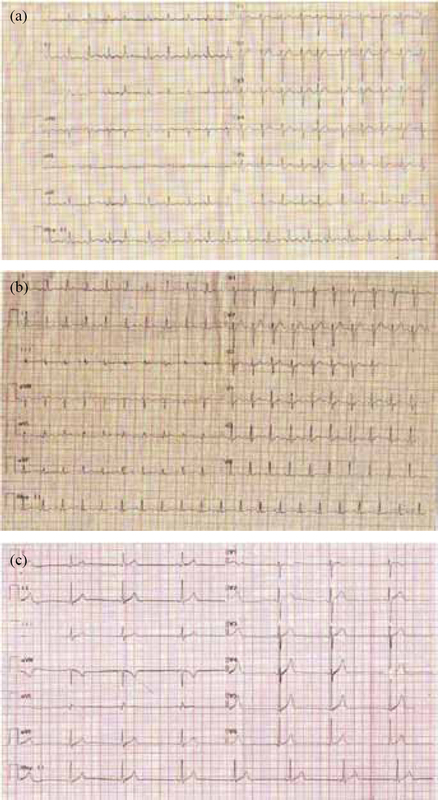 The ECG and echocardiography changes indicated myocardial involvement in severe malaria. Interpretation & conclusion: The present study indicated involvement of cardiovascular system in severe malaria as evidenced from ECG and echocardiography. The study also revealed that cardiovascular instabilities are common in falciparum malaria, but can also be observed in vivax malaria. Background & objectives: West Nile fever (WNF) is a mosquito-borne viral infection, circulated in natural cycles between birds and mosquitoes, particularly Culex species. 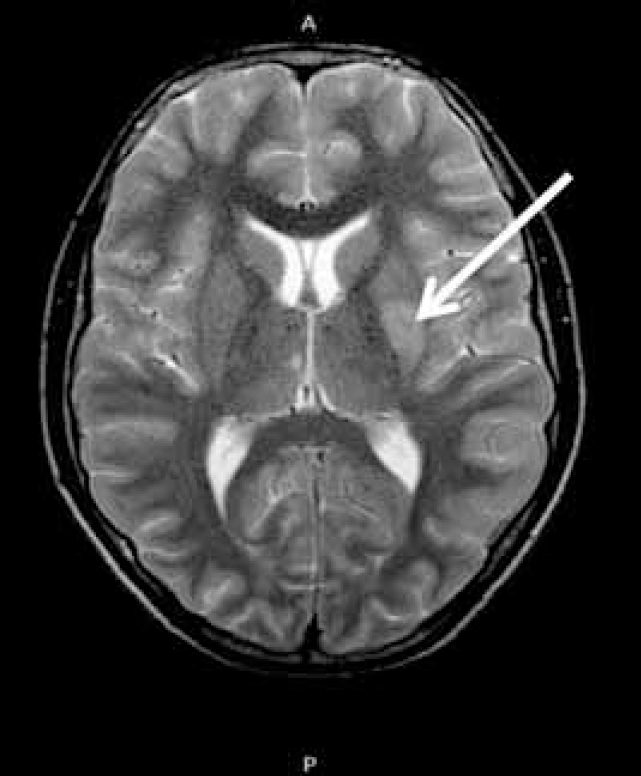 It is transmitted to humans through mosquito bites, and causes a variety of clinical outcomes, ranging from asymptomatic or mild febrile illness to severe men in go encephalitis with some fatalities observed in older or immunocompromised patients. West Nile virus (WNV) transmission is considerably influenced by environmental conditions; and abundance of avifauna and mosquitoes.There are very few reports on WNV exposure in individuals from Tripoli City in Libya. The main objective was to provide basic epidemiological information about the WNV seroprevalence in the human population of Tripoli. Methods: A total of 400 serum samples were collected from persons (123 females, 277 males; age range: 15–78 yr) approaching the Tripoli Reference Laboratory for the purpose of obtaining health certificate; during the period from August to October 2013. The presence of WNV IgG antibodies was evaluated by a commercial kit based on WNV immunoglobulin G (IgG) enzyme-linked immunosorbent assay (ELISA). Results: It was observed that 2.75% (11/400) samples were found reactive in the WNV ELISA assay. This result suggests that WNV has a low prevalence in the study area. Interpretation & conclusion: Seropositivity rates of WNV in Tripoli region of Libya were low. However, continuous monitoring of population is important to keep track of the disease prevalence, risk factors, reservoir hosts and vectors for better understaning of the disease epidemiology and designing appropriate control strategies.